These are some tips and tricks to help you memorize the fretboard. Memorizing the fretboard will help you to instinctively know where to go in order to voice different chords. The first step is to remember the order of the open strings, which is as follows, (from deepest pitch to highest), E A D g b e. Quite often the thinnest three strings, (the ones which aren’t coiled), are written as lower-case letters. 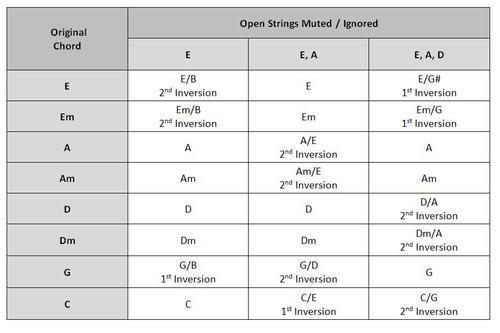 This helps to avoid confusion, being as there are two strings pitched to E.
Secondly, you need to remember that any note on the 12th fret is the same as it’s open string, only an octave higher. The next sensible thing to do is to learn the notes on the deeper E string. Start by learning the notes on the 3rd, 5th, 7th and 9th frets, which are shown below. I have yet to see a guitar that doesn’t mark these frets on the freeboard or at least on the side of the neck. Be aware that a few guitars mark the first fret as well, mostly for aesthetics, so the 3rd fret is not always the first inlay on your guitar neck. The fourth step is remembering that the 1st fret on the E string is an F, the 8th fret is a C, and the 10th fret is a D. It is about this point that you will also need to learn that there are no Cb, B#, Fb or E# notes. If you are playing an E, (open E string), and sharpen the note by a half step, you will be playing F. Similarly, if you sharpen a B by a half step you will be playing C. In reverse, flattening a C will give you a B, and flattening a F will give you an E.
The next step is to memorize the highlighted notes on the A string, which are as follows. Also, remember that the 2nd fret on the A string is a B note. Once you have these seven steps down, it’s only a case of filling in the gaps, which is usually as simple as placing a b or # symbol next to the adjacent note. And there you have it, fretboard memorized.